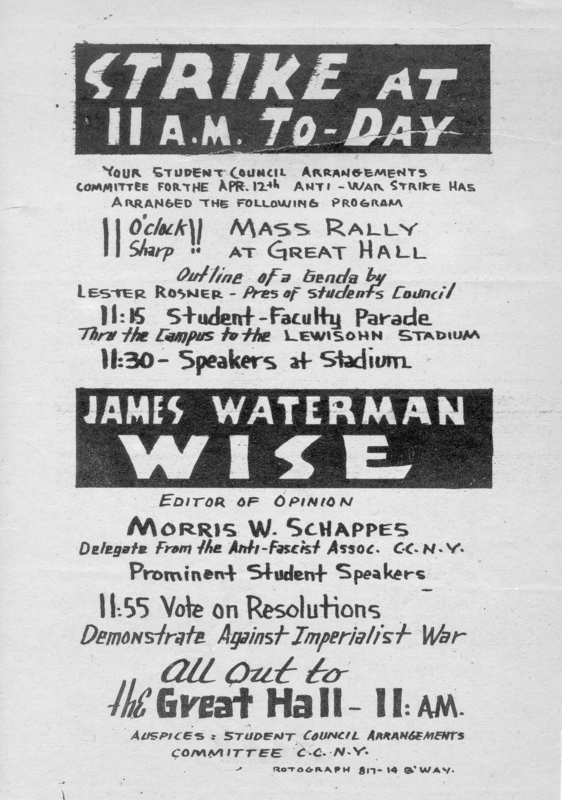 This flier advertises an April 12, 1935 anti-war demonstration at the City College of New York (CCNY). The 11am rally was part of a nationwide day of protest and attracted front-page coverage from the New York Times the following day with the headline: "Nation's Students 'Strike' for Peace." Other demonstrations took place in New York City at Columbia University and Hunter College. In all, some 60,000 students participated in the day's events across the country. At CCNY, around 2,000 students gathered in the Great Hall to protest against war and fascism. The Times reported students carrying placards reading: "Down With Hearst!," "Oust President Robinson!," "Abolish the R.O.T.C. !," and "Build Schools — Not Battleships!" Cite This document | Student Council Arrangements Committee, “"Strike at 11am To-Day," April 12, 1935,” CUNY Digital History Archive, accessed April 19, 2019, http://cdha.cuny.edu/items/show/4012. Professional Staff Congress Joins Anti-War Protest in Washington D.C.
"The Crisis in City College"